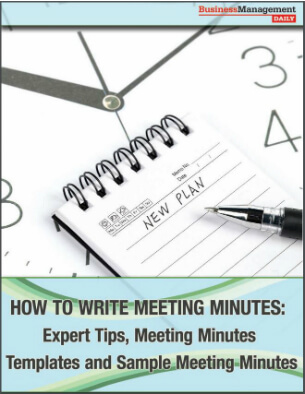 Claim your FREE copy of How to Write Meeting Minutes: Expert Tips, Meeting Minutes Templates and Sample Meeting Minutes! With everything that’s at stake in today’s challenging times, it’s no wonder that employers prize accurate minute-taking skills more than ever before. Minutes serve as a permanent record of what was decided, what actions must be taken, who must take them and when. Business Management Daily, publisher of Administrative Professional Today, designed this special report to teach you tips and tools to take accurate, professional minutes and save time using meeting minutes templates. Whether you’ve never taken minutes before or you want to take your skills to the next level, How to Write Meeting Minutes will help you master the task. When just the thought of creating official meeting minutes makes your writing hand freeze, take note: Preparation starts well before the meeting. In fact, 60% to 70% of a minute-taker’s most effective time will likely be spent in the pre-meeting stage, as one meeting expert pointed out. The work you do during this phase lays a foundation that helps ensure your success upon entering the meeting room. Download How to Write Meeting Minutes to learn eight pre-meeting steps. Ask yourself, as you’re taking notes, “Will it matter in two days, two weeks, two months, two years?” If yes, include it. “I still find myself putting things in my draft that do not matter and later removing them,” Michaels says. Summarize. Don’t record conversations word for word. Do record motions word for word, and indent them for easy scanning. Mr. Hurst made a motion to approve the 2008 ranking list. Seconded by Mr. Goodhart. Use keywords vs. sentences. Tip: Record minutes in a steno pad. On the left side, write keywords; on the right side, make short notations on the keywords. Want the notes to stick in your memory? Write on a color pad. When confused at a meeting, speak up! You’re sitting in a meeting taking the minutes when you suddenly realize you don’t understand what’s being discussed. Speaking up to ask for clarification can be intimidating. Despite that feeling of discomfort, though, it’s best to summon the courage, especially since you’re the one charged with taking formal minutes. The conversation veers off track—now what? You’re taking minutes in a meeting when the conversation suddenly goes off topic. Or, two attendees begin to argue. To what extent should you capture the conversation? “The problem with side conversations: Sometimes people just chitchat and say nothing of value, but other times they say something important,” says Joan Burge, founder and CEO of Office Dynamics. In How to Write Meeting Minutes, she offers tips for turning meeting conversations into a valuable road map—even when the conversation is difficult to track. At her company meetings, senior administrative assistant Amy Finelli uses a meeting minutes template. That way, she can quickly send out notes after the meeting “because I don’t have to figure out how to organize the topics. And it looks the same each time I send it out,” she says. After a meeting is over, everyone will scurry back to their desks to check email messages and resume work. They may quickly forget about the action items they just took on. Your mission? To produce minutes that remind everyone what needs to happen next, and assure them that their meeting time was well spent. Use a consistent format. People refer to minutes to remember what the group decided and who’s in charge of doing what next. Help that information pop out with a consistent format that people will see each time. Include discussion recaps, and key them to the agenda topic they match. No need to give a word-for-word account (see exception in No. 3), nor should you editorialize. Be specific when it really counts. If the group makes a major decision, include synopses of the discussion’s debates and conclusions. A vague account will make your minutes less valuable. List complete names and titles under an “Attendees” headline at the start of your minutes. Should someone refer to your minutes two years later, he might not know who “Bob” was. Present action steps and deadlines clearly by using bullets, underlining or bolding keywords. Make sure attendees can see at a glance what’s expected of them. Pull together the agenda, your notes, any reports or documents that were distributed at the meeting, and verbatim copies of motions and resolutions. If you used your laptop to take notes, it won’t take a lot of time to type your draft. That way, handwritten corrections can be easily and clearly inserted. Ask the leader to review the minutes before you send them out to attendees. This gives him or her the chance to clarify anything, or to add an important point. After you’ve spruced up your notes and formatted the document, you’ll need to make sure all corrections are made to the final version before filing it as a formal record.